We have an extensive range of great health & fitness facilities here at the Galtres Centre which consist of a fitness centre, sports hall and all-weather pitch. For more information, including details of our regular classes and activities, along with current prices download our latest brochure ​(26 Sep 2018). If you wish to book any of our facilities or have any queries then call in ﻿person, or telephone us on 01347 822472, or contact us. During term time we offer a wide range of after school activities which include tennis, badminton, gymnastics. We also provide additional holiday time activities. Details of these are posted nearer the time. Download a Child Booking Form. ​​​For 0-3 year olds. A ball pool, big soft foam shapes and padded flooring provide a safe environment. £2.00 per child, £1.00 for additional child. The fitness centre is fully air-conditioned and state of the art with a wide range of cardiovascular and resistance equipment. Come and enjoy a relaxed and friendly atmosphere and let our professional staff help you to achieve your health and fitness goals. We have a number of membership options available to suit your requirements. The sports hall was opened by HRH Princess Anne in 2009. People of all ages and abilities enjoy our fantastic facilities and many local sports teams and businesses make use of our excellent community sports hall. A great number of activities take place such as football, basketball, tennis, badminton, short mat bowls, karate, various fitness classes and lots more. The all weather outdoor floodlit pitch is suitable for year round activities. The pitch can be used as either two tennis courts or as a hockey or five-a-side football pitch. Tennis rackets, tennis balls and footballs are available to hire. 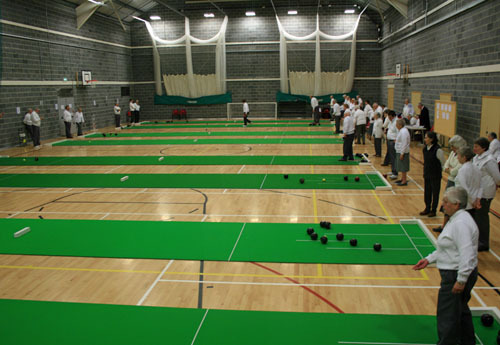 Several clubs and individuals regularly use the games area but there is plenty of scope, particularly during the day, to hire the facility. In addition, the Centre does currently offer tennis coaching for children with a fully qualified LTA coach. The pitch was completely refurbished in July 2017 and utilises the latest technology in artificial grass to reduce degradation by sunlight and is more hardwearing. The centre also has an indoor rifle range, you can find out more about this by visiting the Easingwold Rifle Club.